Ctra. Andraix, s/n, km 10, 07015 Portals Nous, Spanje. A perfect stay in Mallorca. 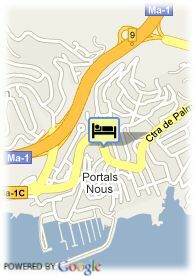 The Marina Portals Hotel is located in Portals Nous, one of the most important places from the Balearic Islands. The establishment offers its clients, privileged views over the Mediterranean Sea. 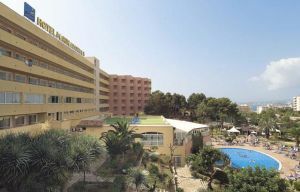 You could enjoy there the discotheque, gymnasium, restaurant, as well as its charming gardens. Furthermore, it has magnificent swimming pools, lounges, tennis course and the possibility to practice any kind of sports. Its 186 rooms are large and comfortable and have all the necessary equipment in order to guarantee the guests' comfort and contentment. The Marina Portals Hotel also is a magnificent framework for companies' conventions and reunions and it offers varied lounges equipped with the up-to-date technology. The quiet and calm environment turns it into an idyllic place where you can take the maximum from any activity. And very close to the hotel, you will find golf courses, beaches, nature and Mediterranean towns with a large touristic offer.